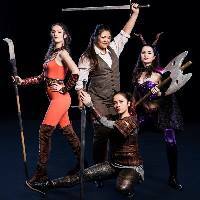 She Kills Monsters is a sly, hilarious and hugely riotous take on Dungeons & Dragons, the role-playing game of the ‘80’s and ‘90’s, as well as an exploration of teenage angst, bullying, isolation and grief. 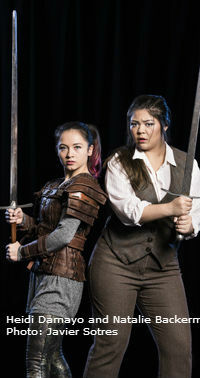 Playwright Qui Nguyen lifts D & D from its niche as a cult game for nerds, geeks and other anti-social weirdos to give it the status of literary fiction where you can learn the truth about life and even yourself. A witty play, the references are to pop culture, not high art. He gently mocks the game, indulging in some deliciously bad writing, “The journey is too perilous and the prize is too personal for me to expect you to risk your lives. I'm just one girl and you all have so much ahead of you.” Stock characters appear, the Mage Steve (Rafael Ruiz) is a running joke, zapped every time he is on stage; and Orcus (Aidan Wright), “the strongest of all demons” and Overlord of the Underworld, is a laid-back slacker. He has in fact lost Tilly’s soul, exchanged for a new TV. Tilly (Heidi Damayo), 15 years old, is truly dead, killed with her parents in an automobile accident. When her older sister, Agnes, (Natalie Backerman) is cleaning out Tilly’s room before moving in with her boyfriend, Miles (Louis Lin) she comes across a Dungeon’s & Dragons scenario in Tilly’s handwriting. Realizing that she hardly knew her little sister and hoping to learn more by playing her game, Agnes searches out Chuck, the Dungeon Master (Jed Weiss) and persuades him to teach her. Agnes’s first surprise is to find out that Tilly, aka Tillius the Paladin, is highly regarded in the gaming world. She plays reluctantly at first but quickly becomes more absorbed as the adventures come thick and fast. The quest is to find the lost soul of Athens, Ohio with Tilly/Tillius, her friends Kaliope, the dark elf (Olivia Lang), and Lilith, the demon queen (Shona Struthers). The four meet with many adventures, most involving a great deal of batttling against overwhelming numbers of monsters. Huge credit must go to the fight director, the choreographer and the sound designer for the complicated and exciting fights which punctuate the drama. It soon becomes clear that the characters of the adventure are drawn from Tilly’s life at school, the school where Agnes is now teaching. In interludes between the adventures, we see Agnes at work, her friend Vera, the (not very good) guidance counsellor, aka The Beholder (DrewAnn Carlson), the mean girls who appear as the Succubuses Evil Tina and Evil Gabbi (Daelyn Lester-Serafini and Anni Ramsay). It also becomes clear that Tilly was a closeted lesbian, hopelessly in love and mercilessly bullied. Agnes reacts with disbelief, anger, argument, acceptance and eventually sympathy, acutely realized by Natalie Backerman. Agnes’ own relationship with her boyfriend Miles is also weighed, again leading Agnes through a range of complex emotions, again well-expressed by Backerman. The boyfriend’s part is somewhat underwritten, but Louis Lin makes a kind if slightly ineffectual Miles. Heidi Damayo is a splendidly athletic and swash-buckling Tillius, the Paladin who can single-handedly see off swarms of bugbears and also a vulnerable Tilly the sister. Puppetry (Nicolette Szabo) costumes (Melicia Zaini) and set (Alaia Hamer) all contributed to the success of this exuberant show.